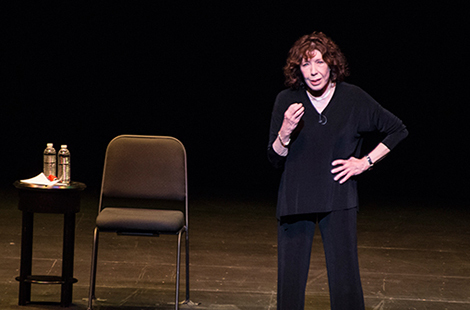 Legendary actress/comedienne Lily Tomlin displayed comedic observations and her classic characters during her sold-out one-woman show at the Valley Performing Arts Center. Read more about the show. The graduating biochemistry major and native of Acton discovered a passion for the sciences and is receiving top honors among 2014 CSUN graduates. Read more about the Wolfson Scholar. The classic Broadway musical came to the Valley Performing Arts Center on May 10 with a performance featuring dancers from the original production working with several CSUN dancers, all under the direction of CSUN faculty members. Read more about the show. Sat., May 17 at 7 p.m. Sat., July 19 at 8 p.m.
Stop by the Colleagues Room May 13-15 to sign the congratulatory banner to thank our 2014 graduates for making CSUN Shine. The president and chief executive officer of the Los Angeles County Economic Development Corporation will be presented a Doctor of Humane Letters for his contributions to the financial health of the region, as well as his longtime support of the university. Five student filmmakers screened their senior projects for approximately 600 people during the 24th annual event.